We all know that J K Rowling enjoys naming things within her Magical World. It’s no different with the titles of her work. We have several clues about this new work: The title, and the art work for that title. 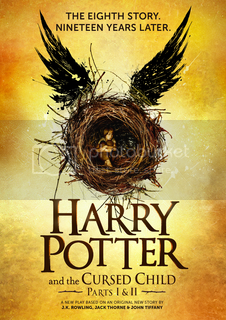 This is the place to discuss what we think the Plays will reveal based on the Title, The Cursed Child, and the art work seen here - https://www.pottermore.com/news/cursed-child-artwork-revealed . 1. We know from the nuggets of hints dropped in Pottermore that the story is about Harry as a mature MoM employee and his son, Albus. But the title plus the art work seems to infer the story is about Albus more than Harry. What do you think? 2. If the story seems more about Albus - Why would Albus be cursed? Who would have cursed him? 3. The artwork depicts a child sitting in a nest, hovered over by wings – what’s your best guess as to the symbolism involved in this? 4. The wings or feathers in the art work – What do you think? Phoenix feathers? Hippogriff’s Wings? Some other creature we have not met yet? Or just symbolic of flying – Perhaps Snitch wings? 5. Based on the title and art work can you propose a story line? It seems to be Albus in the nest (just by comapring the cover with the photos of actors we have), but just to play devils advocate, is he the cursed child? A friend or student he wants to/needs to help? Is he the one doing/causing the cursing (I hope not)? We know how Rowling can turn a story around on us, and have titles with double meaning. Just think of the "Falling Warrior" chapter title in Deathly Hallows, where the reader fears for Hagrid's life as he just fell from the skies mere lines before we see that title. Now if it is Albus, I could see the curse being his father's legacy and him having to deal with it in school. Though the question could be how this curses him more than his siblings. Granted his name is tied in much more with Harry's battles and there might be other things. This could become more literal in him being taunted by fellow students, because he seems different, too quiet or what not that the others find too "different". It would be neat if Rowling decides to put a spotlight on bullying (even if this is not the main plot). I think we are meant to think that the Cursed Child is Albus, but I wouldn't rule out a twist. I don't think it will be a literal curse, and will rather be how Albus (who seems to be like Harry in temperament) will cope with life at school being the son of Harry Potter (and perhaps also of a reasonably famous ex-Quidditch player). I think James didn't have the same problems because he is more like Harry's father, with a lot more confidence. I would be surprised if the Slytherin/Griffindor rivalry has entirely gone away, but hopefully it will be more friendly and less hostile. Yes, the Slytherin/Griffindor rivalry is too old, as that it would totally vanish within a generation. I just hope that, as you describe it roonwit, it is relaxing a bit. I too would not be surprised that the title goes past the obvious choice. I guess it's a wait and see. I just realised that the cover/play art is very much yellow and black. Do you think this might be a play on the Hufflepuff colours? It would be nice if they got more "screentime". A new house to center things on? Unexpected new characteristics found in its students that make them a central part of the plotline? Duh! I didn't pick up the black and yellow colors until you pointed that out atschpe! Good catch. so perhaps we can look for someone in Hufflepuff to be prominent in the story? Hmm Maybe Albus is a Hufflepuff? The thing that puzzles me about the artwork is that the boy looks very upset/cross/reconciled in that nest... My mind travels along with the wings. What if ... the cursed child - presumably Albus - is kidnapped by a magical creature with wings and taken into a nest where he is kept for ransom? Or to lure Harry to his death trying to save him? Or could Albus have runaway with a flying creature such as Buckbeak and hidden in the nest? If you look at the artwork on the Play website the child moves his head to each side and when he looks to the left, he looks upward towards the wings. His body language is totally closed with both his arms and legs locked in crossed positions. Also, the look on his face reminds me of a person who is just resigned to his fate. We know of a younger boy: Hugo (Ron and Hermione's son). So perhaps, following your musing, HealerOne, Albus is the one rescuing the child that is in the nest? Yes, Albus could be a Hufflepuff. That would be a great way to see more of the house. There were many voices saying how they'd have liked to see/read about the Hufflepuff commonroom etc. I've seen several mentions across the net of how the winged nest reminds of a snitch – you touch on this in your questions, Healerne. I can see this, and the thought does intrigue me. Could this be a little hint that we will see more Quidditch references (actually played out or in its symbology) or do you feel this is more Potter fans drawing on what they know and projecting it onto this new era? Personally, I am not sure. Something tells me, if it were a snitch reference, there would be some gold in the wings or nest. But that could of course make it too obvious. If we'd take it as a snitch reference, it could just imply that the child in the nest needs "seeking", "snatching", "winning". You could go further in the symbology thinking their might be two "bludgers" (characters, challenges) hampering who ever is doing the saving. Do you think Quidditch has run its course, or will it reappear more than just a reference? The problem with Quidditch is that it will be almost impossible to do it justice on a stage. So Quidditch might be an element of the story (though if we assume Albus is in his first year he would have to be exceptional to get a place on the team), but I think it would have to be off stage. Yes, roonwit, I thought of the impracticality of staging it, too. They could pull a Wilhelm Tell (the guy who shoots the apple from his son's head) where it is reported by a character watching. A bludger or quaffle could whizz across the scene, or similar little things could indicate the game taking place out of view. Granted the same question can be asked of if and how they'd depict broomstick flying and other magic, but maybe I should move that question to the novel vs. play thread, so we don't lose track of artwork and Title here. I just had a thought. Since the child in the nest appears to be more blonde than dark haired - could that child be Scorpius? I mean that might make some sense - him being the Cursed Child? He gets to Hogwarts and instead of being placed in Slytherin, he gets shuffled off to Hufflepuff. Hmm. Maybe runs off to hide from shame? What do you think? That would really be a nice twist, Healerone. It would give the plotline a chance to heal the rift between Slytherin and the rest on many levels. Even if he were to stay true to his ancestory and is a Slytherin, if he is the one who needs saving, it gives the other houses (not only Gryffindor) a chance to recognise they are all the same and worth supporting. It could also offer growth to Draco Malfoy, perhaps even to Harry and fellow Gryffindors (there is a terseness in how he greets Draco in the epilogue). Some of you may already be in the midst of reading joy as I write this, so this is my last chance to get in any pre-release (at least, pre-release in my time zone) theories! I too missed the possible symbolism with the yellow and black colors in the art work. I do not think the wings look like that of a snitch (though I'd love me some quidditch! ), nor those of a hippogriff. They are not fancy and are really black... could they be from a raven...? I don't know if there will literally be a child in a nest in the story. Since JKR has said that this is a story that can only be told as a play, my theory is that there will be things in the story that are shown in an imaginative, fantasy-based way, which would not blend in with the real-world style that the novels (and subsequent films) have been written. So perhaps a despairing child (I do think it will be Albus) imagines a peaceful refuge from his troubles in a safe comforting nest, and the play shows him in one, even if he does not literally travel there. Whatever we encounter, I have high expectations for a work from the imagination of JK Rowling, and I do not expect to be disappointed! OK so I was so wrong on the possible storyline. However, JKR's story was much better than my ideas. So the Title - Who is the Cursed Child? Got to say there are cases for Albus, Scorpius, Harry, Cedric, and Delphi. See this post http://forum.discussionstation.com/index.php?topic=901.0 in the Play vs Book Thread. The artwork? Now that's a bit more problematic. The nest could be symbolic for family or the family's home. Albus leaving the nest - off to Hogwarts, or perhaps that he really can't disassociate himself from being the famous Harry Potter's child? No bird's nest that I saw in the story. Barely an owl in the story, but early on they did speak of Graphorns. And there is the reference to Auguery - ".. a thin and mournful looking bird ... vulture in appearance ... intensely shy, nests in brambles and thorns ..." FBAWTFT. Now that would fit and would associate Albus with Delphi.. Ah now we are getting closer to what the artworks mean. But The Yellow and Black colors? Hmm I don't see a Hufflepuff reference - except if that is for Cedric? What do you think now that you have read the story? the most cursed of children, the figure inside the 'snitch nest' resembles what I would think Albus looks like. So, as Healer One mentioned, family springs from a nest. The "Resurrection Stone"
representative of connection with family was located of course inside a snitch. At the time that Harry felt that he was about to die, he was not fetching his family, he felt they were fetching him. One twig, or strand of Cursed Child involves both fetching and being fetched, especially between Harry and Albus. I liked the effort that both characters made to re-establish their father and son relationship. (There were some nice, touching spots in the plot. I felt a bit disappointed with plot and character development overall; seemed like a go at fan fiction requests, and those not really worked through.) The Cursed Child art,hinted at by others, also may suggest the need for Albus to be able to find the freedom to be unique among the Potters and yet be accepted as part of them. As I read, I also thought of common saying of "the bird leaving the nest" as a child grows up. And it does feel like Albus and Scorpius growing up and out of the shadows of their respective fathers. Also many birds build their nests, high and well out of reach and Albus shows this kind of loneliness in having none but one friend – he finds himself (or has caused himself to be) out of reach to his peers.